Google’s virtual reality efforts are getting a lot of press these days, so what’s all the commotion? For the past two years, Cardboard has been the flagship of Google VR. If you’re new to the world of virtual reality, Google Cardboard is essentially housing made of cardboard that turns your smartphone into a virtual reality viewer. Similar products include Oculus Rift and Samsung’s Gear VR, but they come with a hefty price tag. A Cardboard viewer, on the other hand, will run you about $20 or less; Google even provides the blueprints if you want to create your own from scratch. 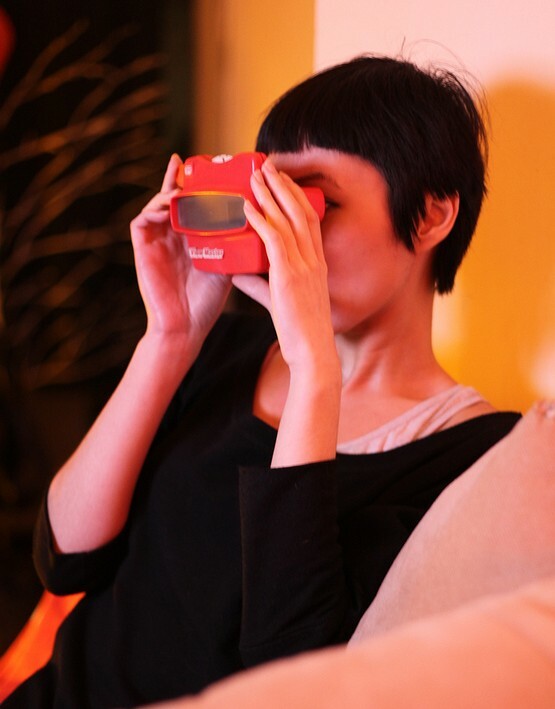 If you’re still scratching your head, think back to the good ‘ole View-Master. With Cardboard, you’re also looking at images through a viewer, but the experience is more interactive. Instead of viewing stagnant images, you can watch 360-degree videos that respond to your movements. For instance, in Bjork’s 360-degree music video, you’ll see Bjork standing on a beach in front of you, but you can also look up at the sky, down at the sand, even behind you. Pretty impressive stuff, eh? Unfortunately, creating a 360-degree video isn’t quite as affordable as viewing one. GoPro has a VR camera rig called Jump that can be yours for the low low price of $15,000. That said, you can create your own 360-degree still images for free with the Google Street View app! In Google terms, these images are called “photo spheres”, or a series of images stitched together to recreate a 360-degree experience. I took one of my office and the process was incredibly simple; the app prompts you to move your phone around as you take photos to capture your whole environment. The final product isn’t 100% seamless, but the price is right and sharing is remarkably easy. If you’re eager to try out Google Cardboard, check out the #360Video YouTube channel. Even without the viewer, this will give you an idea of what we mean when we say virtual reality. In addition to Cardboard, Google recently announced a new virtual reality viewer platform called Daydream, set for release this November. Daydream is considered an upgrade to the existing Google Cardboard viewer at more than double the price ($80). If you’re curious about VR, Cardboard remains an excellent choice for beginners. Daydream may be the latest model, but it’s unlikely to rival the simplicity, DIY quality, and accessibility of Cardboard. You might also want to check out upcoming events in the Digital Tools and Visualization Methods for Humanists series, which will be covering a variety of topics from 3D Scanning and Printing to IQ-Tables to much more. When do you prefer pen and paper over mobile apps or software? I was recently asked this question and it made me realize how different the two mediums are with certain tasks. I personally cannot imagine using a mobile app to figure out a math problem, or pen and paper to write a paper. Yet there are times I’d like to save notes written on paper and be able to reference them electronically. Fortunately, LiveScribe recently debuted a new wifi “smartpen” meant to bridge those two mediums together and provide an alternative to a clunky stylus. The LiveScribe Sky wifi pen instantly digitizes anything you write and sends it via wifi to a mobile device. It can be synced with the Evernote application, making it very easy to reference for later use. It also has the capability to record sound as you are writing, which makes it perfect for taking notes in a lecture or presentation. You can also tap the notes on the paper and the audio will play from when the notes were being written, which may help you decode sloppy text. This smartpen must be used with special paper because a camera, built into the pen, records the position based on tiny dots within the paper. The writing is scanned at 72-dpi resolution and once uploaded to Evernote, can be searched. Currently this pen is available in 2GB, 4GB, and 8GB capacities. Users also get 500 MB of storage through a partnership with Evernote. The Pearson Foundation recently came out with a report that highlights the changing landscape of tablet usage among students, in both high school and college settings. The study was done to “gauge college students’ and college-bound high school seniors’ opinions about digital device ownership and purchase intent; perceptions towards tablets; tablet usage and features of interest; and preferences between digital or print formats when reading, studying and doing other school-related activities.” The outcomes are particularly interesting for a number of reasons-while ownership of devices is still low (only 7% of the almost 1100 college students and 4% of the 200 high school students surveyed owned tablet devices), the interest in tablets is booming. Nine out of ten of those who own tablets said the device helped them study more effectively and efficiently, and three quarters of those surveyed said they thought tablets helped students perform better in class. One of the biggest shifts, researchers note, is the way that this interest in and acceptance of mobile technology affects the use of digital textbooks. Check out the entire report! The .pdf format was developed by Adobe Systems as a way of preserving document layout across computing platforms. Short for Portable Document Format, .pdf files emulate the traditional structured layout of print books. As a result, it is an excellent format for publications that require tight control of layout, fonts, and images, such as legal or technical documents. The price of this level of precision is a limited ability to resize and reflow text. Originally a proprietary format, Adobe has made .pdf available as an open standard. PDF files are also easily viewable desktop computers using free software like the Adobe Reader. The .azw format is the propriety format used by the Amazon Kindle eReader. All eBooks purchased from Amazon’s Kindle Store are delivered in this format, which includes a proprietary Digital Rights Management system that requires users to use a Kindle or Kindle software. Amazon has made its Kindle software available for desktops, smartphones, and tablets, allowing readers to read their books on any device. Unlike the .pdf format, .azw files are “reflowable” and allow readers to adjust the font size, background color, etc., of their eBooks. The Kindle and Kindle software will also read the legacy format on which .azw is based, called Mobipocket (.mobi). Many books at Project Gutenberg are available in this format. The .epub format is an open standard developed by the International Digital Publishing Forum. ePub files are reflowable and allow readers to adjust the font size, background color, etc., of their eBooks. The IDPF hopes to finalize the ePub 3 standard by mid-2011, which will include support for embedded video and audio. ePub files are supported by several devices including the iPad, Barnes and Noble Nook, Borders Kobo, and the Sony eReader. The Google Books project and Project Gutenberg both offer books in .epub format. All three of the eBook formats discussed here can come with a variety of proprietary digital rights management encoding that may limit which files may be read on which devices. Savvy business for “dumb” phones? The Social Network (also known as “The Facebook movie”) batted a little under .500 Sunday night at the Academy Awards, ultimately racking up three wins – for editing, best original score, and best adapted screenplay – from its eight total nominations, including a potential Best Actor nod to Jesse Eisenberg for his role as CEO Mark Zuckerberg (I find Justin Timberlake a bit more compelling myself). Oscar, Schm-Oscar, Zuckerberg himself might say: 600 million users strong, Facebook rolls on, a juggernaut seemingly immune to the frequent kerfuffles raised by users over privacy of user data, interface changes, and how to finally, once and for all, suppress all those Farmville notifications from so-and-so. With that many users, it’s no surprise that there’s plenty to say about Facebook. Some might be most interested to consider the possible ramifications of the company’s move last month to raise millions of dollars, from Goldman Sachs and an unnamed Russian investor, in what appears to be the prep for going public. Others might find the story of a Spanish nun expelled from her convent for – that’s right – “spending too much time on Facebook” compelling. Unsurprisingly, I was most attracted to this story: no longer content to provide apps just for smartphones, Facebook is moving into the “feature phone” market. What’s a “feature phone”? Flip phones, candy-bar phones, or others … slightly lower-end than often pricey smartphones, feature phones can run some applications, but aren’t built around an operating system like Apple’s iOS, Google’s Android, or Microsoft’s Windows Phone 7. While the pundits are lining up to say that 2011 will stand as the tipping point for smartphone adoption in the United States (see our own Bret’s post on the topic, plus the Horizon Report 2011 [PDF]), there are still millions and millions of feature phones in use in this country, and millions more around the world. Now all those folks can download the Facebook feature phone app, and get 90 days of free data. Maybe not long enough to get them tossed out of a convent, but probably plenty of time to get hooked for Facebook Mobile to become part of their day-to-day. Will other corporations and providers move into the feature phone market? As tablet sales take off, will consumers opt to spend there and save on phones? At least one person has recently noted his interest in pairing his tablet with a feature phone (through which he could create a Wi-Fi hotspot). What happens when two disruptive technologies collide? I don’t know, but if I figure it out, I’ll be sure to post it in my Facebook status.